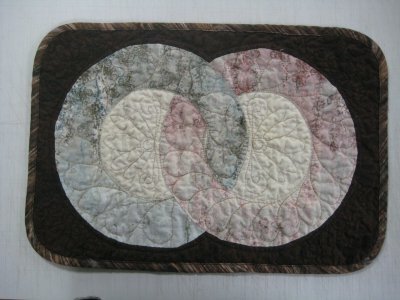 Note: this project has both a Quilting and a Machine Embroidery component. If you're interested in only one, click on the links provided and you can skip the other part. In February 2010, I ran across a fabulous pattern, "Rainforest Rings". That ombre shading in the rings immediately caught my interest and I bought the pattern. When it arrived, I was disappointed to realize that the beautiful gradation of color in the rings was due the to the FABRIC being shaded, not the piecing! Ah well .... a little disappointment is just part of life. Since I wasn't going to learn anything new and different from this pattern (as striking as it was), I put it away for "sometime later". Later in February, I attended a quilt retreat in Phoenix, AZ (capably organized and put together by the incredible 7 Phoenix hostesses of About.com's Quilting Forum). This was my 9th year in attending and it's one of the highlights of my year. :-) This year, our goodie bag contained a gift card to the quilt store, 3 Dudes Quilting, which is across the street from the hotel. Although I had made no plans to buy any fabric this year (Lord knows I have enough of my own stash), I did need to use that gift card. So, during one of our forays to the store, I went looking for ombre fabric. Quilt stores are very individualistic and reflect the taste of the owner(s). Unfortunately, a quick run through the store revealed that 3 Dudes Quilting didn't have any obvious ombre fabric. I made a much slower tour of the store, looking carefully at the stock they did have to see if ANYTHING would work for Rainforest Rings. Happily, I found two bolts that were vaguely ombre and would work, although they sure weren't like the pattern cover. Upon my return home, I went to work on the placemats. The instructions are clear and offer different techniques, depending on whether you want fussy cut fabric in the middle or not. If you don't want to fussy cut, then you don't have curved piecing for the center sections ... and this is the version that I chose. Since my ring fabric was to be the star of the show, I needed a unobtrusive background fabric for the center of the rings, as well as the surrounding borders. The fabrics for the placemat itself, as well as the binding are quilting cottons. From past experience, I knew that a thin batting is needed for placemats; batting with any kind of thickness will make glasses wobbly. To reduce that possibility, I used plain white flannel as the batting. The backing was simple muslin. The pattern also offers directions on how to sew the rings to the border fabric, depending on whether you want to applique by hand or by machine. 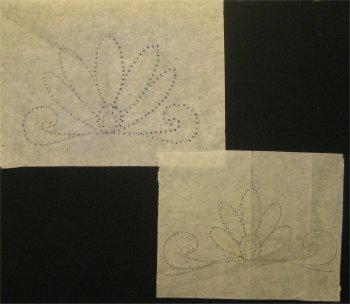 I'm in a needleturn applique mode these days, so that is how I chose to attach the rings. 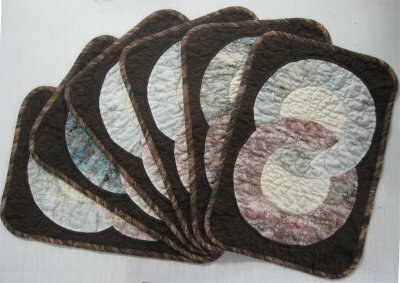 These are big rings with gentle curves; making all six placemats didn't take very long. I'm getting much better with needleturn applique and I was pleased with my efforts. That being said, I wasn't in love with the final result. Oh, the workmanship was fine (what?? you expected anything less???) but the cover image of the vibrant, ombre rings was what was in my mind and what I really wanted. The fabric I bought was much more subdued and while the placemats turned out very nicely, they just weren't the same image as in my mind's eye. I put them aside to be another UFO. 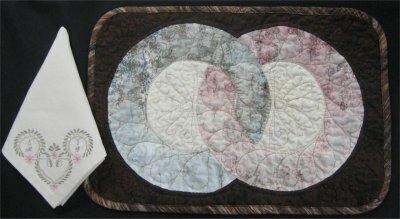 I sized a graphic I found to create a quilting design for both the center and corners of the placemats. (The corner design was slightly smaller than the center design). I copied the sized graphics onto crisp tracing paper, then "sewed" the traced design with an unthreaded needle in the sewing machine. The perforated paper was then used as a stencil. 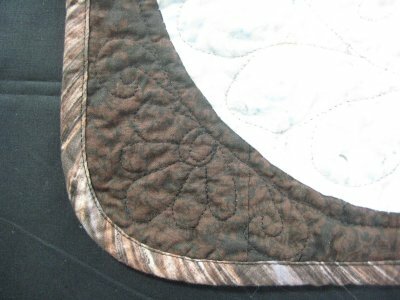 When I used the Quilt Pounce, the powdered chalk went right through the holes to leave the design on the fabric. For the rings, I just freehand drew a feather with a chalk pencil. The chalk marks gave me a "road map" to follow for the quilting. All of the placemat quilting was done free-motion on my home sewing machine. I didn't use any sort of frame set-up. Placemats are so small, you really don't need anything. I know there is a nifty way that Cindy Roth of Longarm University uses to quilt a set of placemats on the longarm, but I had already cut out the backings before I remembered it. The center design and feathers in the rings were stitched in Superior's Metallic gold thread. I've tried various metallic threads over the years and have found that for my machine(s) (previously, a Singer and currently, Janome 6500), Superior Metallics really *are* superior. They don't break and they feed evenly. I didn't want the corner design to be noticeable, so I stitched those in black Masterpiece (also by Superior). Here's the final version of the quilted placemat and a close-up of the corner quilting (which, as you remember, was intentionally stitching in black so as to be less visible). As a tie-in to the rings, I rounded the corners of the placemats. 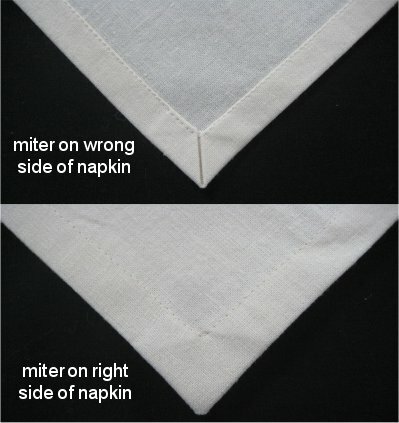 I have made a tutorial on how to make those mitered corners for napkins; no webpage, just a PDF (verbage & photos) of directions. There have been designs (from others) that I've stitched out with less than stellar results, which have left me wondering if it was the design, the thread, the stabilizer, my machine, the hooping process, the moon being in the 7th house but Jupiter not being aligned with Mars, excessive dust bunnies under the bed or something else that caused me to be unhappy with the stitchout. I chose the embroidery thread colors to coordinate with the colors of the rings. I have a variety of embroidery thread manufacturers on hand; I don't have a loyalty to any one in particular (except for Superior Metallics; they are the only metallics I like to use). 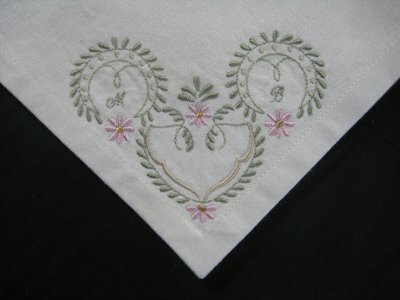 For these napkins, I used Floriani polyester, Smart Needle polyester, Superior metallic, Mettler Poly-sheen polyester. Some fabrics will tend to retain the shape of the embroidery hoop if they are hooped directly. Linen is one of them. To avoid "hoop burn", you need to hoop the stabilizer ONLY, then afix the fabric to the stablizer. You can do this with spray adhesive, pining or basting. In this particular case, I happened to have Floriani Wet-n-Gone tacky water soluble stabilizer on hand. This is pretty nifty stuff: a water soluable (fibrous type)sheet has a sticky, adhesive surface, covered by a protective paper. When you peel off the protective paper, the adhesive is exposed and then you can stick your fabric to the hooped stabilize. The adhesive keeps the fabric from moving around, yet you don't need to hoop the fabric! Best of all, once the embroidery is finished, the stabilizer disappears when soaked in water! Having a stabilizer that doesn't show on the back is important when you have items where the reverse side will be seen. 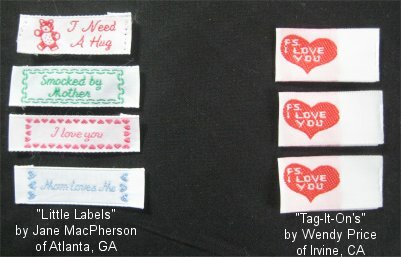 Recently, I saw another, different small, sew-in, woven label, "Tag-It-On's" by Wendy Price of Irvine, CA ... these labels said "P.S. I love you" ... absolutely darling! I promptly purchased a package of one dozen at a reasonable price. Neither "Little Labels" nor "Tag-It-On's" sell directly to the customer; you need to buy them through a retailer. 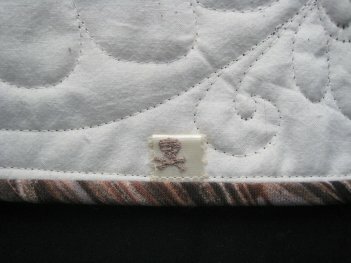 SewForum.com is a machine embroidery forum that I participate in. They have a section where participants can upload designs that they have created for the use by the rest of us. There are some very, very talented amateur digitizers out there! One such generous person digitized a VERY small skull-and-crossbones. Well, I collect virtually everything piratey and I've had this one for some time. Sadly, I can't find it on the forum any longer, so it might have been removed. In any case, it's VERY small ... less than 1/2" square. 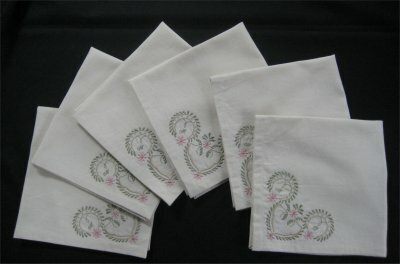 Here's the complete set of 6 placemats and 6 napkins.